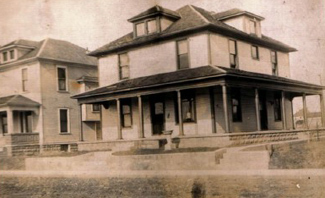 This is a photo of the Josiah Dixon Ferree home in Ohio. Date taken is not known but the 1900 U.S. Census shows the family living at that time in Turtle Creek Township, Shelby County, Ohio. It's thought they may have left Ohio sometime around 1908. 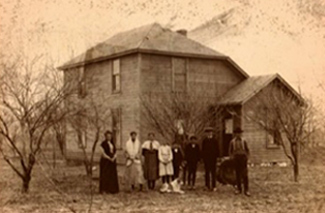 The 1910 U.S. Census shows the family living in Deer Creek, Custer County, Oklahoma. This photo shows home in Oklahoma. It is said that when they first arrived there was only a mud hut to live in. The bed bugs were so bad in the hut that Josiah built a barn for them to stay until a house could be built. Their daughter, Cora, died that winter and she was kept in the barn with the family to keep the animals from getting her body until she could be buried in the spring. Josiah Dixon Ferree, son of Jeremiah Daniel Ferree and Rachael Leah Bryant was born on November 17, 1867, in Ohio and died in 1936. Photos and information courtesy of John Baker, a great, great grandson.